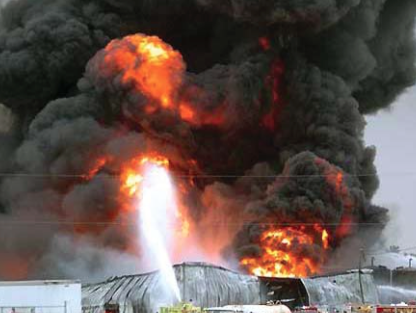 This formidable fire at Stern Oil in Iowa, once again showed why you should be prepared with F-500 Encapsulator Agent. Even after two crash trucks from nearby airports arrived with the finest mil-spec foam, the firefighters were losing ground. F-500 EA was the right solution. Foam has to form a perfect blanket and separate the fuel and the oxygen. Like most fires, there were three-dimensional structures involved, making it difficult to create the blanket of foam. Also, the metal tanks and building were so hot, the fuel would just autoignite, because foam doesn’t cool. Why did the F-500 Encapsulator Agent work? Because F-500 EA rapidly cools the fuel and surrounding structures. Independent testing has shown F-500 EA to cause a permanent 1000ºF temperature drop in 1-2 seconds. If you remove the heat, you remove the fire. At the same time, F-500 EA encapsulates the vapors and surface fuel, rendering it nonflammable. The thick black smoke turns into a warm, white vapor as F-500 EA interrupts the free radical chain reaction. Interrupting this chain reaction also works to extinguish a fire, but also greatly reduces toxins in the smoke. You can read more details about the fire by clicking here.. Previous post: Are You Prepared for Today’s Class D Fires?